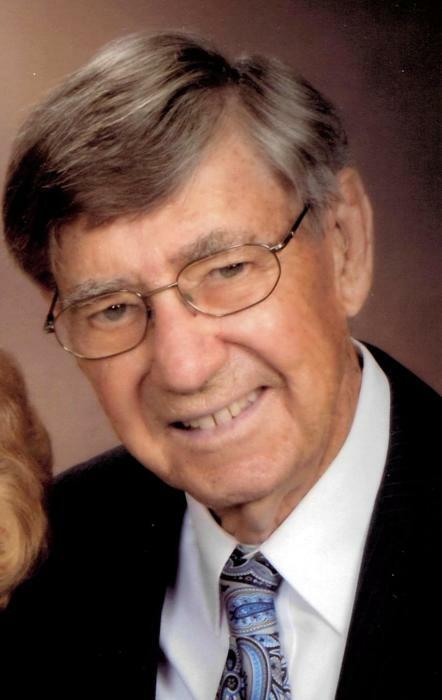 Charles Edward Jackson, 88, of Fairview, Kansas died Thursday, March 21, 2019 surrounded by his family at his home in Sabetha. Charles was born on July 11, 1930 on a farm west of Sabetha to Samuel M. Jackson and Helen (Lanning) Jackson. He attended Fairview High School, playing basketball and running track for the Bulldogs. He graduated in 1947. After briefly working at the Fairview Elevator, he joined the Farmers State Bank in 1949. Except for two years serving in the United States Army during the Korean War, he would remain at the bank until he retired in 1997. He served as Bank President from 1969 to his retirement. He married his high school sweetheart, Joanne Klein, upon his return from the military in 1953, and they made their home in Fairview until moving to a retirement apartment in Sabetha in 2011. Charles was a proud and active member of the Fairview community for his entire life. He was a member of the American Legion and the Fairview United Church of Christ, where he served on the consistory and sang in the choir. A kind, generous and patient person, he took great pleasure in attending the sporting events and other activities of his children and grandchildren. He also enjoyed watching sports and playing golf. He was preceded in death by his parents; and a son, Brad Jackson of Topeka. He is survived by his loving wife of 65 years, Joanne (Klein) Jackson of the home; as well as his son, Greg Jackson (Sherry) of St. Joseph, Missouri; his daughter, Janet Strahm (Clark) of Sabetha; and his son, Jeff Jackson (Brenda) of Lawrence. He is also survived by eleven grandchildren and 15 great-grandchildren, a daughter-in-law, Kathy Jackson of Topeka, Kansas, as well as his brother, N. Gail Jackson of Timonium, Maryland. Funeral service will be held Monday, March 25, 2019 at 11:00 a.m. at the United Church of Christ in Fairview, Kansas. Visitation will be from 10:00 a.m. until service time at the church. Memorial contributions in Charles’s memory may be made to the Fairview United Church of Christ or the Nemaha County Home Health & Hospice, sent in care of Popkess Mortuary, 823 Virginia Street, Sabetha, KS 66534.